In our last couple of blog posts, you’ve been helping your niece build a content marketing strategy for her lemonade stand. You told her about the Content Marketing Pyramid and how to complete it. The next time you see her, you ask if the Content Marketing Pyramid has helped her sell lemonade. She sounds less than confident. This is a marketing mentality: You design your content to fulfill a specific content marketing goal, because your content communicates different ideas or desired action. This is an editorial mentality: You tailor your content to reach a specific audience, because your audience has different wants and needs. Brand awareness targets an audience with a general interest in brand values and products. The foundation of the pyramid has an audience that wants to learn about the kinds of values and products your brand promotes. “So you should write brand awareness content that relates to people who like lemonade, health, organic products, and positive thinking,” you tell her. Lead generation targets an audience with a specific interest in brand products. The next layer has an audience that wants to hear about the types of products your brand offers. “So I can just tell them about my lemonade?” she asks. This audience wants to find solutions to their problems. They think your products – or products similar to yours sold by different brands – could help them. Consumer engagement targets an audience with a specific interest in brand values. 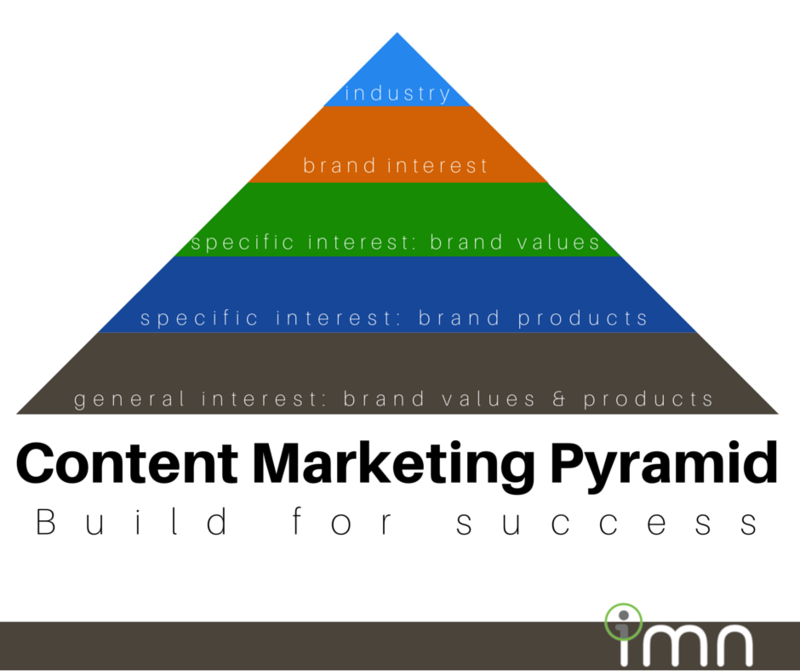 The middle level of the Content Marketing Pyramid has an audience that wants to talk about the types of values your brand advocates. “What does ‘advocate’ mean?” she asks. This audience wants to find new ideas and opinions to include in their value system. They also want to challenge outdated or mistaken ideas and opinions that contradict their value system. They think your brand – or brands similar to yours – promotes values and ideas important to them. Customer loyalty targets an audience with a specific brand interest. The fourth layer has an audience that wants to know more about your brand. “These people like your brand, and they like telling people about your brand,” you tell her. This audience wants to hear your triumphs and understand your changes. If you give them your brand story in interesting, compelling ways in a format they can share with others, they may even advocate your opinions. Thought leadership targets an audience in the brand’s industry. The top of the pyramid actually has the biggest potential audience. In general, a thought piece will relate to a specific audience within a brand’s industry. It could be an audience with a general or specific interest in a brand’s products or values, or an interest in the brand and how it relates to the industry overall. “Wow, my thought leadership is for anybody? Explain again why I can’t just skip to thought leadership, because it sounds the most useful,” your niece says. To establish that expertise, your brand must offer valuable content that relates to your audience’s values, needs, wants, desires, worries, and ideas. Otherwise, they won’t listen to content that tries to change their mind about your brand. Our next post will teach you (and your niece) how to find and use the right channels to send the right message to the right audience. We’ve followed our own advice in creating the Content Marketing 101 Series. We want to empower you to create better content. We know you face obstacles on the path to better content, and we know you want to be a success story. Although we can help you make better content, we’ve also found great content marketing strategies you can follow on your own. What Are You Doing for National Financial Literacy Month? Is Your Direct Selling Business a Partner or a Supplier to Your Distributors? Success Story: Are You Fostering a Strong Relationship With Your Bank Customers? Download a copy of our survey report to learn how fellow marketers implement their content marketing efforts.